An upright classic producing carpets of colourful flowers. Top seed raised variety to give the best results and great value. Perfect with summer flower plants - immense flower power fills in the gaps. Lobelia String of Pearls is the perfect filler plant for pots, planters and tubs, or even large scale border plantings. 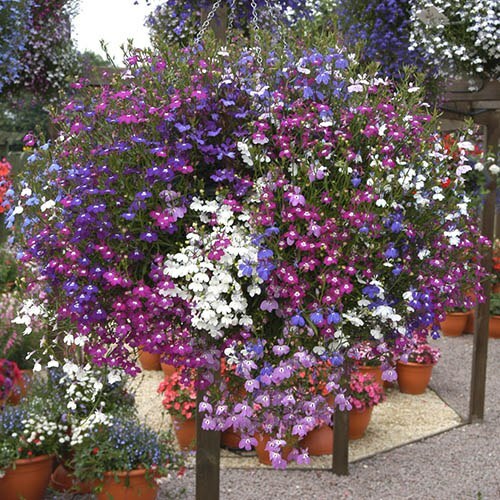 It's mix of pale blue, purples, pink and whites, plastered with hundreds if not thousands of flowers, creates a lovely frothy and delicate contrast to larger flowered petunias and geraniums. Very easy to grow, they simple wind their way through the gaps in plants, filling them in with ease. A great little essential plant for all planting schemes. Supplied as a tray of 40 seedling plugs (1.5 - 2cm diameter). These will need pricking out into 6-10cm tall for 4 weeks or so on receipt, before planting out.